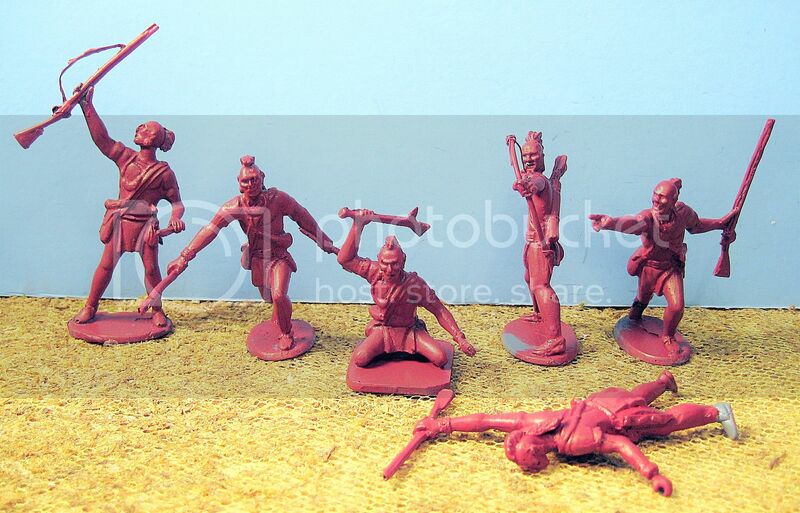 The first set of my original 54 mm Eastern Woodlands Indians arrived and I slapped some paint on them, so that you can see the detail. Just a slop coat, so that I could get these pix taken quickly. You'll see places where I missed putting color. I plan on repainting each one carefully, later on. I acquired the master sculpts and the rights to these figures in 1993. It took me 25 years to finally get them produced in something other than metal. 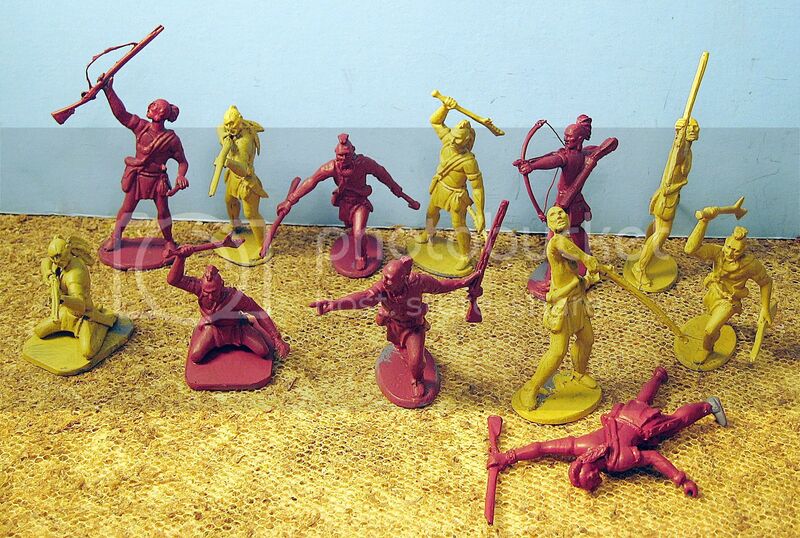 I used "Barzso" Indian colors, (red and tan) because I will be mixing these in with my Barzso Indians. And to pay tribute to Ron, in my own small way, who certainly deserves it. 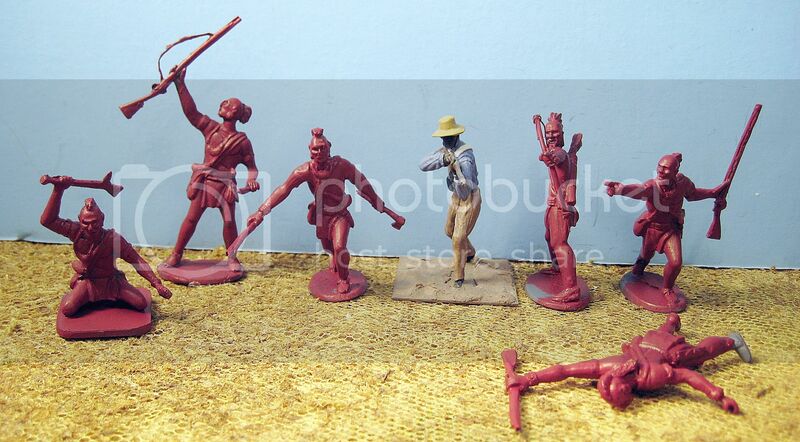 So, here is the very first set of original Eastern Woodlands Indians. 12 poses in all. These should fit the time period from the F&I War up until the War of 1812. Consideration is underway to add a few new poses to this set. 54mm is a wonderful scale for skirmish game consideration too, but the metal ranges can be expensive (especially if pre-paints like the John Jenkins line are desired), and figures in soft plastic always risk losing their coatings if painted, so resin sounds like a great alternative. Do you still have these available in metal? Nice Bill – as my eyes get older I may have to move up to 54mm, I have pretty much abandoned 15mm for 28mm, this may be the next step in aging!!! look forward to seeing them painted up, and with your BEAUTIFUL basing and terrain techniques. I would find suitable figures to field against them and run a game.